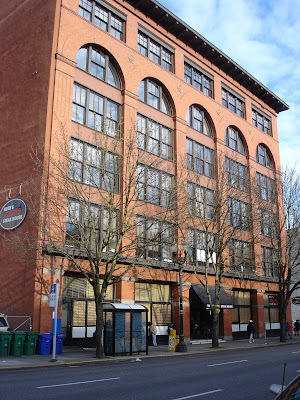 As Portland’s downtown moved inland in the eighteen eighties and nineties, the size, the shape and the look of its buildings changed as well. Out of fashion were the elegant cast iron fronted commercial buildings with their Italianate facades and tall narrow windows. A new, solid, muscular style of brick and stone was appropriate for an ambitious young city recently connected to the rest of the country by rail. 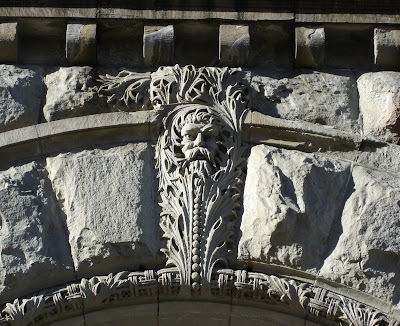 The style, which revived the wide-spread use of the Romanesque arch in commercial, domestic and public architecture, is often referred to as “Richardson Romanesque” after its most influential practitioner, Henry Hobson Richardson (1838-1886). -Lewis Mumford, “The Brown Decades, a Study of the Arts in America 1865-1895”. 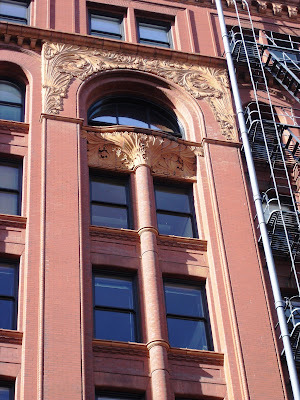 The hallmarks of the style featured brick, rustic stonework, Roman arches and, less common in commercial buildings, towers. 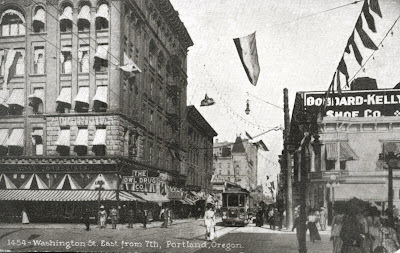 In Portland, the style began to infill near the riverfront in the late 1880s, then, beyond Second Street, it advanced westward before losing momentum around Seventh Street (Broadway) in the second half of the 1890s. 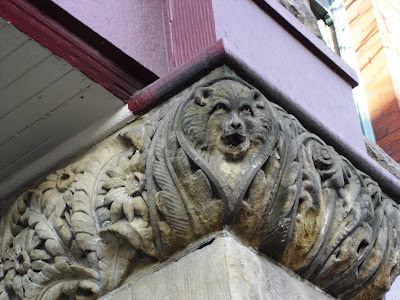 Unlike the cast iron fronted buildings that preceded them or the terra-cotta adorned buildings which followed, there is no single book specifically about Portland’s Romanesque commercial architecture. 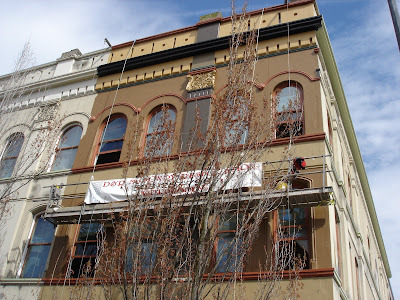 The Skidmore Building (under restoration). 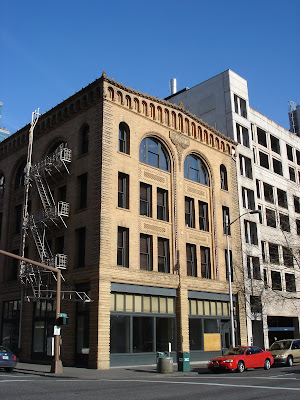 Elements of the Richardson Romanesque Style appear in the Skidmore Building (1889) on First, just north of the Burnside Bridge. 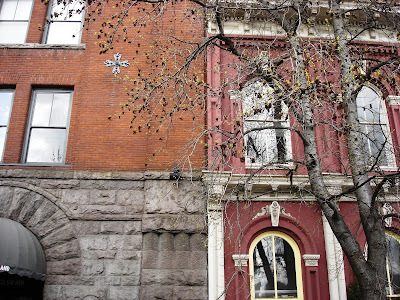 It has a limited application of cast iron details but also the stone base and arches (but not exposed brick) of Romanesque revival. 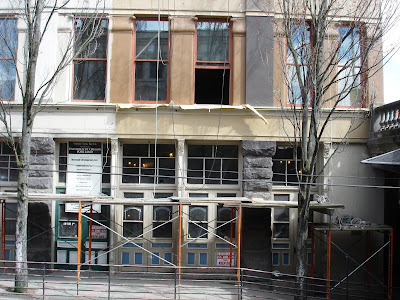 The Skidmore Building, along with the Bickel Block and the White Stag / Hirsch-Weiss Building is currently undergoing restoration to house the Portland based programs of the University of Oregon. The New Market Annex (1889). The style appears in full fledged form with the New Market Annex (1889) and the Parker-Scott building (1890) both built amongst their Italianate predecessors in the old riverfront downtown on First and Second. Where the New Market Annex and the South Wing of the Market Theatre meet illustrates the style shift that took place in the last quarter of the nineteenth century. 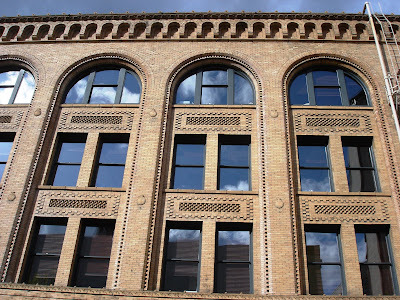 The Packer-Scott Building (1890) (also known as the Skidmore Fountain Building) will soon be the home the headquarters of Mercy Corps. 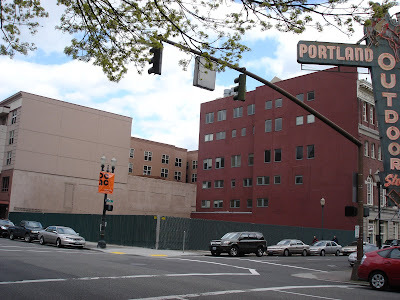 The Hotel Portland and the Marquam Building. West of Fifth Street a new downtown, located disquietingly close to the upscale residential enclave of the Corbetts, Failings and Ladds, was rising in truly monumental scale. 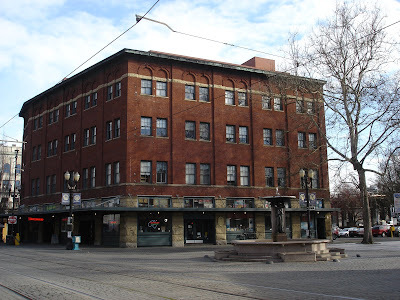 The Hotel Portland, the Marquam Building along Morrison between Sixth and Seventh and the Oregonian Building on the north west corner of Alder and Sixth were each massive undertakings more or less in the Richardson style. Of the three, the Hotel Portland had the strongest link to H.R. Richardson himself, being designed the firm of Whidden and Lewis. William M.Whidden had previously worked with the firm McKim, Mead and White, of which Charles Follen McKim had studied under Richardson. None of the buildings survive. 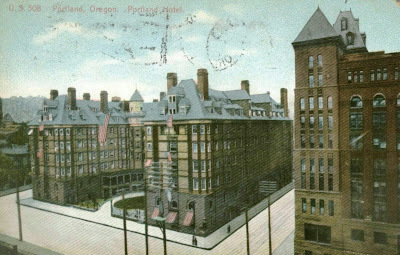 The Hotel Portland was torn down to make a parking lot for Meier & Frank in 1950, (today the location of Pioneer Courthouse Square). 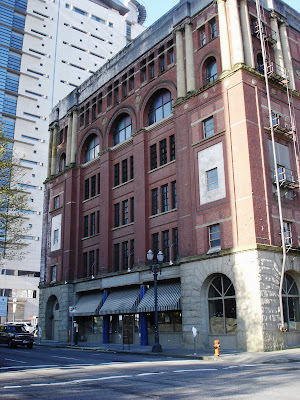 The Marquam Building was torn down in 1912 after the collapse of its south east side (see the earlier post “The Wreck of the Marquam Grand”). 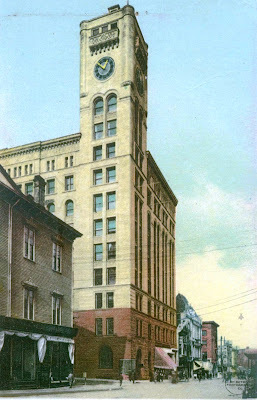 The Oregonian Building was replaced by a new headquarters on Broadway in 1948 and torn down in 1950. Between the old riverfront downtown and the new downtown rising on the outskirts, the main commercial district of the 1890's was between Second and Fourth streets. Along that corridor Portland was well on the way to becoming a city of brick. The Worchester Building (1892) at Third and Oak featured a delightfully chaotic hodgepodge of styles. The French Second Empire style mansard roof was unusual for Romanesque revival architecture. The building was torn down in 1941. SW Third and Oak today. The yellow-gold brick of the Gilbert Building on SW Third and Taylor (1893), like that of the old Oregonian Building, was less common than the ubiquitous red brick. 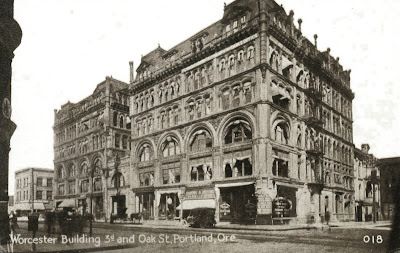 According to “An Architectural Guidebook to Portland” by Bart King, the building was probably designed by Whidden and Lewis, which makes it a cousin, of sorts, to the Hotel Portland. 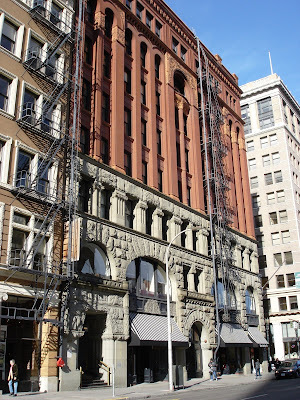 The Auditorium Building on SW Third between Taylor and Salmon (1894) uses classical columns on its fourth floor to a much more restrained and harmonious effect than the nearby Ancient Order of United Workmen’s Temple. Thankfully, it was not necessary to do so. Detail of the Auditorium Building. 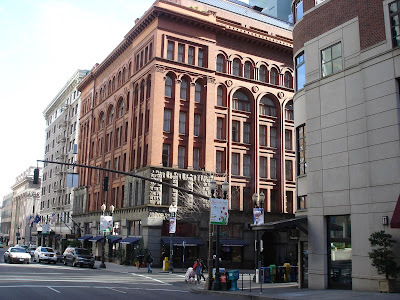 The commercial application of the Richardson Romanesque style was not confined to downtown Portland. 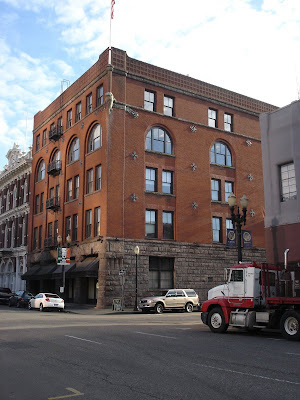 On the east side of the river, the style appeared in smaller, but no less impressive buildings such as the Logus and the Smithson blocks in the newly consolidated former cities of East Portland and Albina. The Logus Block (1892) on the corner of SE Grand and Washington. 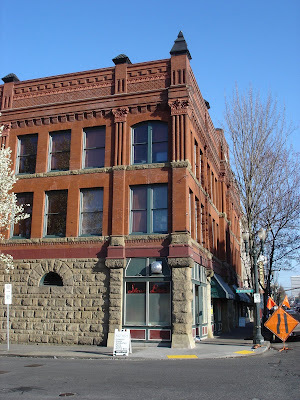 The Smithson Block (1893) in old Albina on the corner of N. Russell and Interstate Avenue (on the portion of which was known as Delay Street in the nineteenth century). 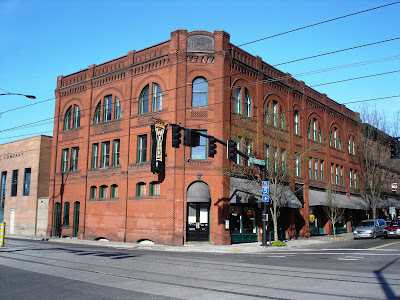 It currently houses the Widmer Brothers Gasthaus pub. 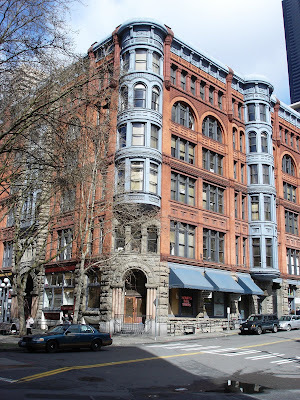 The Richardson Romanesque style reached its apex in Portland with the Dekum Building (1893) and the Imperial Hotel (1894). 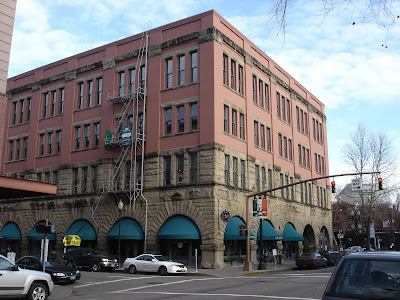 The Dekum Building, SW Third and Washington. The Imperial Hotel, today the Hotel Vintage Plaza, was built in 1894 on the corner of Washington and Seventh (Broadway). It was designed by Englishman Frederick Manson White, who also designed the similarly tasteful Auditorium Building (note the columns on the buildings top floor, which are very similar to those that appear on the fourth floor of the Auditorium Building). The turn of the century Imperial Hotel at Seventh and Washington (with an Owl Drugstore on the ground floor). By the 1950’s the Imperial was known at the Plaza. 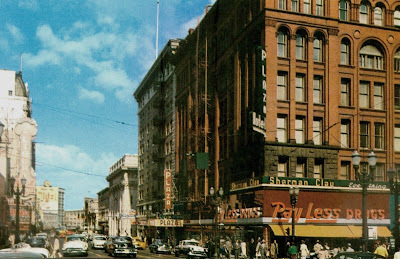 Note the Payless Drugstore, on the ground floor on the corner of Washington and Broadway. 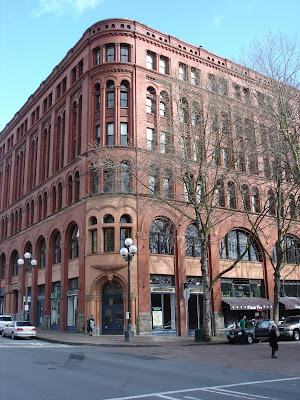 The Sherlock Building (1896) marks the end of the Romanesque style in Portland. 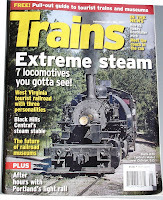 It looks oddly current, resembling if anything, a revival of its own style. 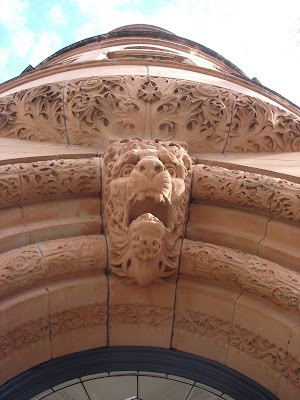 In “An Architectural Guidebook to Portland” Bart King notes that it combines elements of the Romanesque and Chicago School. It is a transitional building, perhaps an evolutionary dead end or an oddly prescient prediction of a distant future nearly a century away. The Sherlock Building on the south west corner of Third and Oak. Contrast the Sherlock Building with the Worchester Building built only four years earlier, which was located diagonally across the street on the north east corner of Third and Oak. 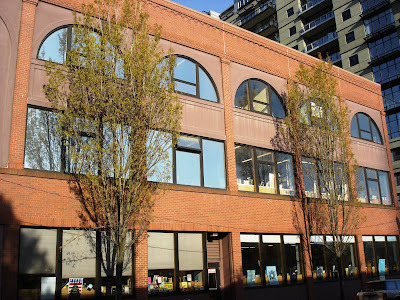 The north east wing of Powells Books, built in the mid 1990s. 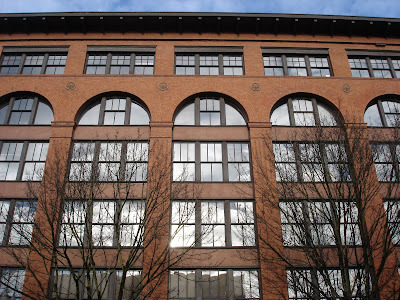 This survey, tracing the arch of Richardson Romanesque in Portland’s commercial architecture from the Skidmore Building to the Sherlock Building is by no means complete. 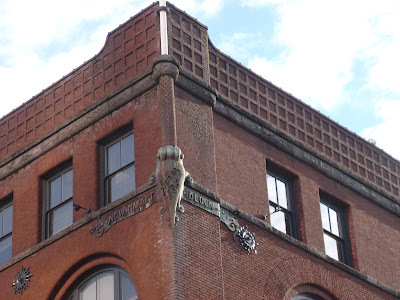 Public (such as the Armory) and private (such as the William Temple House) examples Portland Romanesque architecture deserve attention in their own right. 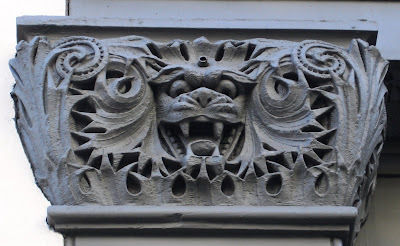 Much of the oldest part of Seattle’s downtown dates from the age of Richardson Romanesque. Portland’s great fires of 1872 and 1873 cleared away much its frontier era wooden structures. 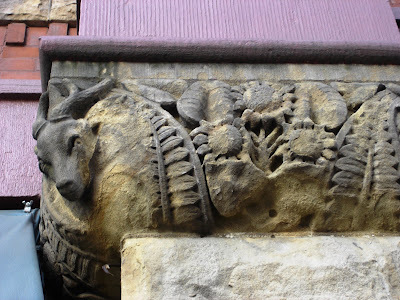 The result was a blank slate for builders at the height of the Italianate cast-iron era. In Seattle's great fire of 1889, much the same thing happened, but at the peak of Richardson's influence. 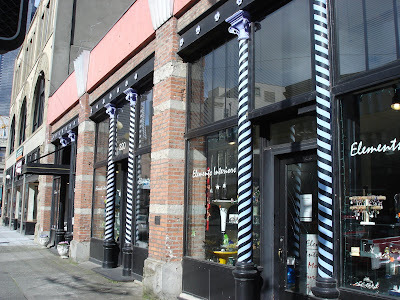 When Seattle rebuilt, it was in brick. The area from King Street Station, to the Sound abounds with fine examples of Richardson style with buildings such as the Pioneer and Interurban buildings. 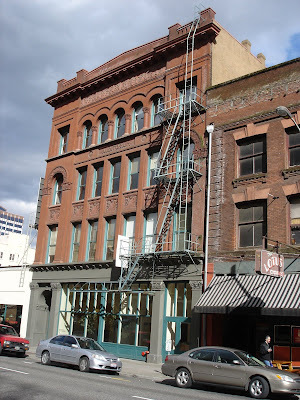 One of the few cast iron fronted buildings I came across on a recent visit to Seattle. Even so, the building has some Richardson elements, along with tarted up columns and the truly unfortunate addition of an art deco cornice. 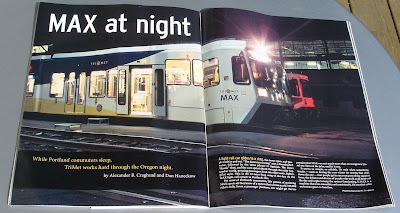 Those interested in a behind the scenes look at Max should check out this months Trains Magazine (the May 2007 issue) for the article “Max at Night” written by Alexander Craighead and myself.